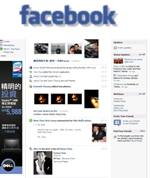 You are here: Home » News » Facebook Display Advertising in Hong Kong Now Available! Facebook Display Advertising in Hong Kong Now Available! June 18th, 2008 • Comments Off on Facebook Display Advertising in Hong Kong Now Available! Facebook is one of the largest and fastest growing socials networking website in the world launched in February 2004. Facebook has more than 64 million active users worldwide. In recent months, Facebook became the talk-of-the-town in Hong Kong while its user base in Hong Kong has grown more than 250% growth within 5 months. According to comScores, the number of active Facebook user in Hong Kong have now reached over 1 million. Tapping on the power of social networks and growing popularity among users in Hong Kong, major advertisers and brands such as McDonald’s, PCCW, Hong Kong Tourism Board, Nike, Adidas, LG Mobile, SCMP and more have created their own branded Facebook application. We are now excited to announce that through Microsofts global partnership with Facebook, display advertising (Super Banner 728×90 and 120×600) is now available to advertisers in Hong Kong to reach local users. Facebook display advertising forms a critical part of Microsoft Digital Advertising Solutions (MDAS) offering in Hong Kong together with ever popular advertising platforms such as MSN.com.hk (Portal), Windows Live Mail, Messenger and Spaces (Community and Communications). Advertising on Facebook together with MDAS products will be marketed and sold by Pixel Media, the exclusive advertising sales partner in Hong Kong. The Microsoft – Facebook collaboration provides the ideal platform to bring advertising to a naturally viral market environment. Facebook offers users an interactive platform to build personal profiles, share interests, Websites, and photos, and connect with other users. Display Advertising opportunities available on Facebook include 120×600 Skyscraper and 728×90 Super Banner across different sections. Dell Computer is the first advertiser in Hong Kong to launch the campaign in Facebook on April 7, 2008. What are you waiting for? Be amongst the first to tap on this hot and growing social network in Hong Kong to promote your products and services.